After seeing a ton of Instagram posts at Lin Asian Bar + Dim Sum Restaurant, I had been dying to go for, like, months. Not only is it freaking adorable, but it serves soup dumplings, and the owner Chef Ling has a pedigree from Wu Chow. I just hadn't been able to get out there until last week when I was invited to a lunch with someone who worked nearby. So, I jumped at the opportunity to FINALLY try it out. And...it was good. But...not great. First of all, it IS extremely adorable. The Clarksville cottage is brightly decorated, and every nook is a feast for the eyes, but it is jam-packed in there. All of the tables are so close together and so tiny that it's impossible to have more than one dish on there at once (sorry Instagrammers). I didn't have to wait since my lunch partner was already there, but at 12:30 p.m. on a Friday, it was insanely full. Also, the parking is simply atrocious. I'm not gonna lie--I parked at Better Half and prayed I wouldn't get towed during my meal. As for the food, the legendary soup dumplings ARE tasty, but they didn't knock my socks off like I wanted them to. The soup portion wasn't hot enough and the meat was kind of nonexistent in the bite. The pan-fried veggie dumplings fared better with their crispy edges. But, the scallion pancake with curry dip was my favorite dim sum dish. The pancake was doughy and yummy by itself, and the curry dipping sauce was extremely flavorful and perfectly seasoned. I would have eaten a whole container of it. 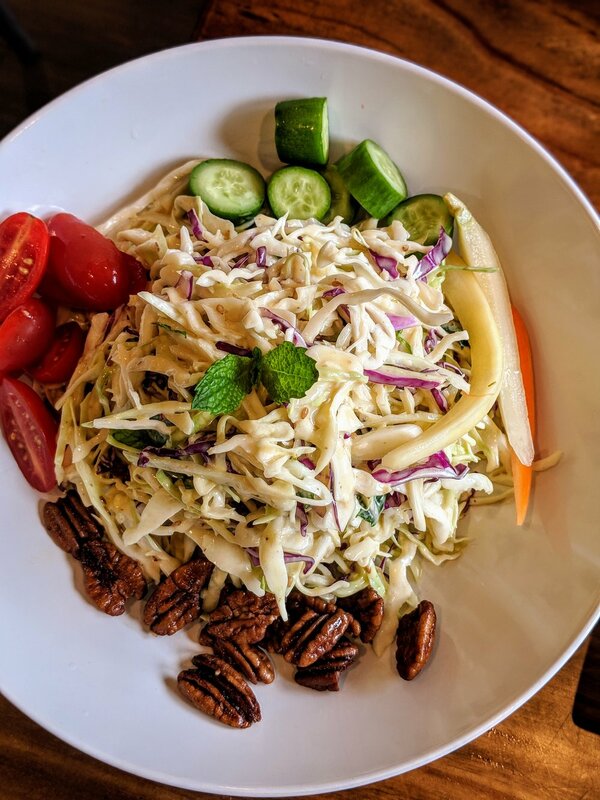 My lunch companion suggested the cabbage salad with an almond-sesame vinaigrette, which didn't sound that enticing to me; however, it really surprised me. The dressing is light and refreshing, and all of the salad veggies are crisp. It was a nice reprieve from the other carb-heavy bites. 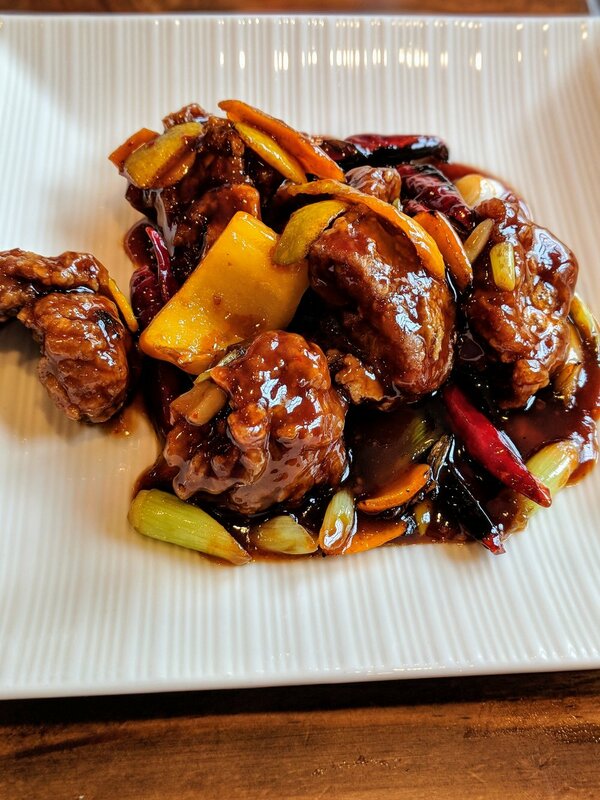 For an entree, we shared the orange peel beef with hot and sour soup, which I normally adore. I wasn't a huge fan of Lin's soup, which was a bit bland, but the orange peel beef hit all the right spicy and sweet notes and was dressed in a sticky brown sauce that deserved to be sopped up with all the rice. All in all, I enjoyed my meal at Lin Asian Bar, but I guess I expected to be blown away more, especially since I absolutely adore Wu Chow. I'm happy Austin's Asian cuisine scene is expanding though--after all of the Italian and pizza craze over the last year or so, our city deserves more high-quality Asian eateries in town!